Nothing really prepares you for the staggering beauty of the amazing ancient city of Petra, which was carved into the sheer rock face on the slope of Mount Hor in a great rift valley among the mountains which form the eastern flank of Wadi Araba, and originally developed over 2600 years ago by an Arab Tribe. Petra is located in southwestern Jordan about 50 miles (80 kilometers) south of the Dead Sea, surrounded by towering hills of rust-colored sandstone which gave the city some natural protection against invaders. 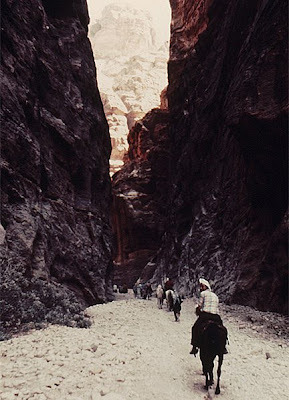 Enclosed by towering rocks and watered by a perennial stream, Petra not only possessed the advantages of a fortress but controlled the main commercial routes, turning it into an important center of trade for silk, spice and other routes that linked China, India and southern Arabia with Egypt, Syria, Greece and Rome. 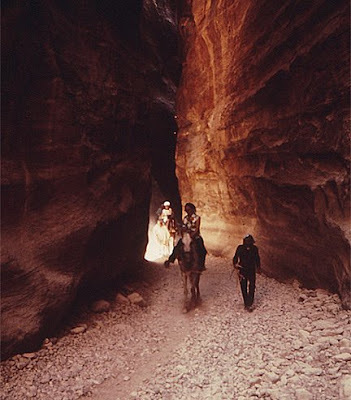 Although the city may have been accessed from the south in ancient times, the only entrance to the city is through a 2 kilometer dry water course called the Siq — a dark, narrow gorge of dazzling rock formations and colors only 10 to 13 feet (3 to 4 meters) wide in areas — flanked on either side by soaring cliffs over 300 feet (100 meters) high. As you reach the end of the Siq you catch the first glimpse of Petra’s most elaborate and awe-inspiring ruin, Al-Khazneh — the “Treasury” — hewn directly out of the sandstone cliff, and just the first of the many wonders that make up Petra. The “Treasury,” named as such in the mistaken belief that the urn contained gold. The massive façade is sculpted out of the sheer rock face with deeply-carved architectural elements, and dwarves everything around it at 105 feet (35 meters) wide and 140 feet (43 meters) high, making it the largest freestanding structure in Petra. 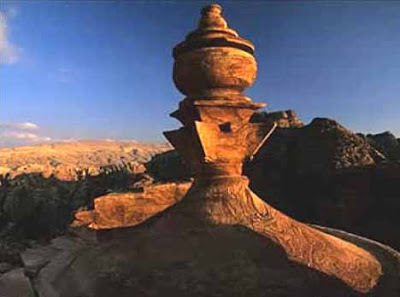 It was carved in the early 1st century as the tomb of an important Nabataean king and epitomizes the engineering genius of these ancient people. As you enter the valley you’re overwhelmed by outstanding architectural achievements — hundreds of elaborate rock-cut tombs with intricate carvings. Unlike the houses which were destroyed mostly by earthquakes, about 500 tombs survived which were carved to last throughout the afterlife. The Nabateans believed that the soul departed from the body and continued to live after death, so it should therefore continue to be fed and clothed by its living descendants, which is why there are so many tombs at Petra. At the foot of the mountain called en-Nejr, a little farther from the Treasury is a massive Roman-style theatre which could seat 3,000 people. It stands at the point where the valley opens out into the plain the site of the city, placed to bring the greatest number of tombs within view. The amphitheatre was actually cut into the hillside and into several of the tombs during its construction. Nearly enclosing it on 3 sides are rose-colored mountain walls, divided into groups by deep fissures, and lined with tombs cut from the rock in the form of towers. There are obelisks, temples, sacrificial altars, and streets lined with rows of columns. A flight of 800 rock cut steps leads you high above, overlooking the valley, where the impressive Ad-Deir Monastery is located. Also known as ad-Dayr in Arabic, the Monastery is so huge that the doorway is taller than many houses. The façade is some 165 feet (50 meters) high and 130 feet (40 meters) wide. The door is a staggering 30 feet (9 meters high). 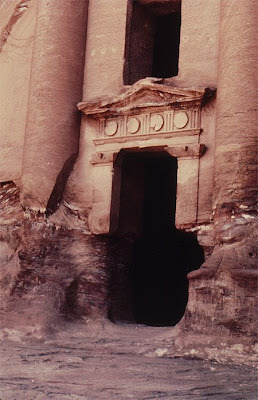 Its name, like most Petra structures, does not reflect reality; it was possibly a Nabataean temple. According to Arab tradition, Petra is the spot where Moses struck a rock with his staff and water came forth, and where Moses’ brother Aaron is buried at Mount Hor, known today as Jabal Haroun or Mount Aaron. 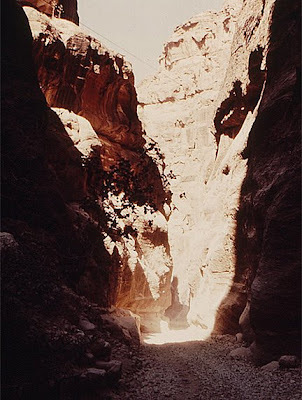 The Wadi Musa or “Wadi of Moses” is the Arab name for the narrow valley at the head of which Petra is sited. 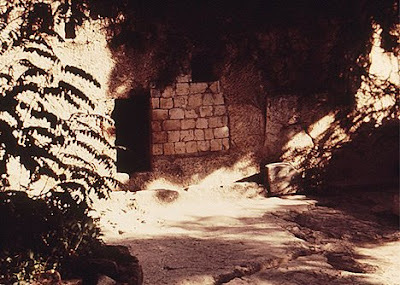 A mountaintop shrine of Moses’ sister Miriam was still shown to pilgrims at the time of Jerome in the 4th century, but its location has not been identified since. 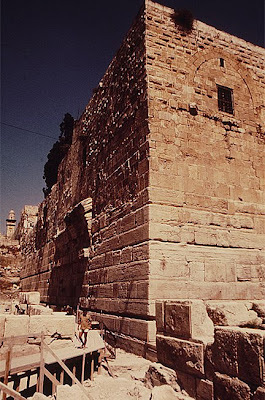 The 13th century shrine built by the Mameluk Sultan Al Nasir Mohammad to commemorate the death of Aaron, the brother of Moses, can be seen on top of Mount Aaron in the Sharah range. 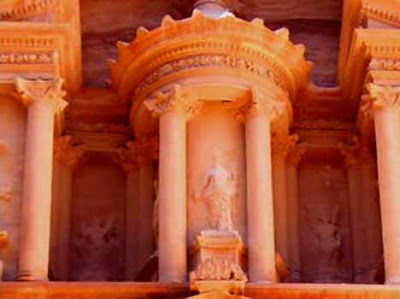 There are 2 museums within the site — Petra Archaeological Museum and the Petra Nabataean Museum — which display finds from excavations in the Petra region and an insight into Petra’s intriguing past. 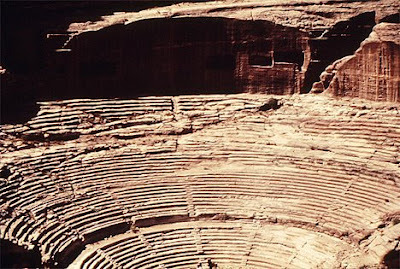 Excavations have revealed that the Nabateans had the ability to control the water supply that led to the rise of the desert city, in effect creating an artificial oasis. 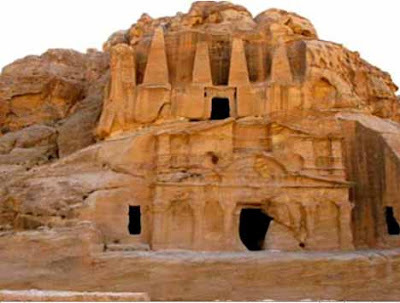 The area is known to have flash floods and archaeological evidence shows the Nabateans controlled them by the use of dams, cisterns and water conduits. Water could be stored water this way even during prolonged periods of drought, and the city prospered from its sale. This road, built from the period when the Romans invaded Petra in 106 AD, runs across the valley floor, and was once lined with temples, palaces, shops, and houses. 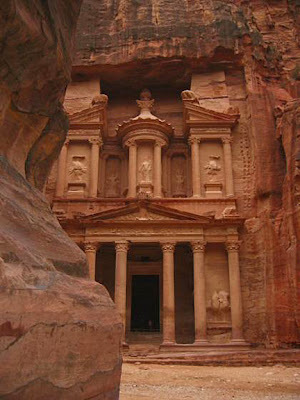 History of Petra : So far, no method has been found to determine when the history of Petra began. 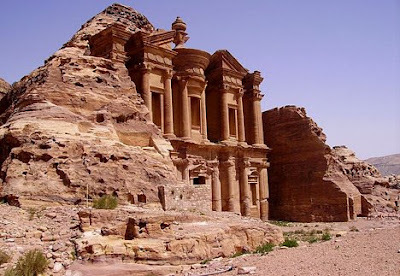 But evidence suggests Petra — from the Latin word “petrae” meaning rock — was first established around the 6th century BC by the Nabataean Arabs, a nomadic tribe who settled in the area and laid the foundations of a commercial empire that extended into Syria. This part of the country was traditionally assigned to the Horites, likely cave-dwellers, the predecessors of the Edomites. 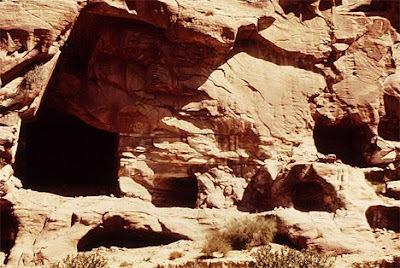 The habits of the original natives may have influenced the Nabataean custom of burying the dead and offering worship in half-excavated caves. The town grew up around its Colonnaded Street in the first century AD and by the mid-first century had witnessed rapid urbanization. 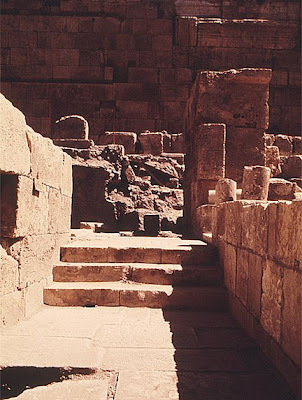 Following the flow of the Wadi Musa, the city-center was laid out on either sides of the Colonnaded Street on an elongated plan between the theater in the east and the Qasr al-Bint in the west. 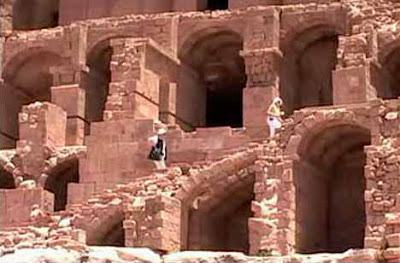 Among the most remarkable of all Nabataean achievements is the hydraulic engineering systems they developed including water conservation systems and the dams that were constructed to divert the rush of swollen winter waters that create flash floods. In 131 AD Hadrian, the Roman emperor, visited the site and named it after himself, Hadriane Petra. 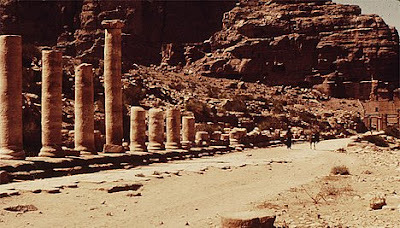 Despite several attempts by the Seleucid king Antigonus, the Roman emperor Pompey and Herod the Great to bring Petra under the control of their respective empires, Petra remained largely in Nabataean rule until around 100AD, when the Romans took over. It was still inhabited during the Byzantine period, when the former Roman empire moved its focus to Constantinople. The Byzantine community recycled many standing structures and rock-cut monuments, while also constructing their own buildings, including churches — such as the recently excavated Petra Church with the extraordinary mosaics. Among the rock-cut monuments they reused is the great tomb or the Ad-Dayr (known as The Monastery), which was modified into a church. In 363 an earthquake destroyed many buildings, and crippled the vital water management system. A devastating earthquake had a severe impact on the city in 551 AD, which all but brought the city to ruin. 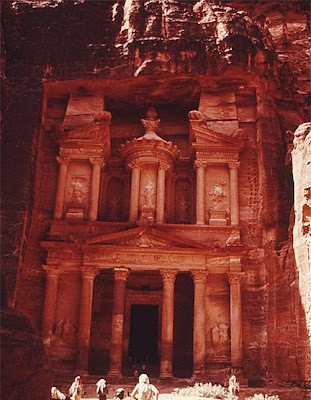 With the rise of Islam, Petra became a backwater community. The Crusaders constructed a fort there in the 12th century but soon withdrew. After the Arabic occupation, it lost its importance little by little, the trade routes changed that went through Petra, and after that it just lapsed into silence. The long-hidden city remained unknown to the Western world until 1812, when it was rediscovered by Swiss explorer Johann Ludwig Burckhardt, disguised as an Arab sheik. Gaining the trust of the local tribesmen, he learned of the secret gorge which led to the “City of Rock,” and was determined to see it. Petra remained accessible only to Europeans accompanied by local guides with armed escorts until after World War I.
Petra was designated as a UNESCO World Heritage Site in 1985 when it was described as “one of the most precious cultural properties of man’s cultural heritage,” and classed as one of the New Seven Wonders of the World on July 7 2007.